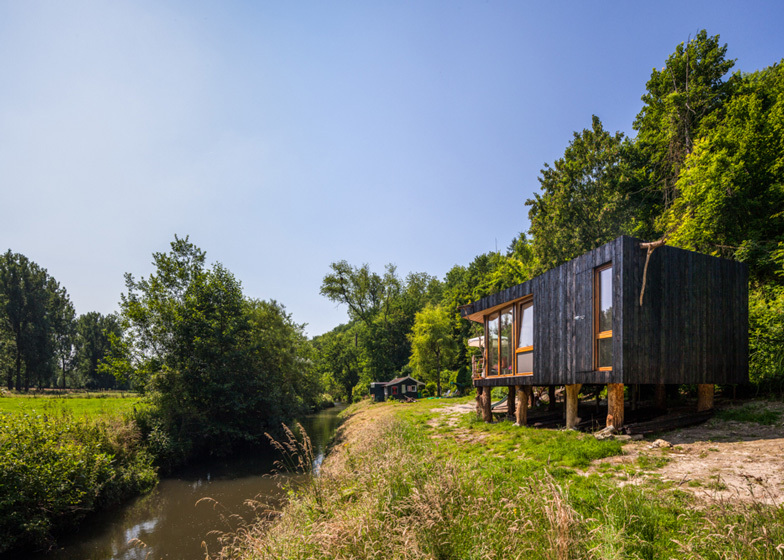 This riverside holiday house in South Limburg, the Netherlands, is raised on tree trunks to prevent flooding and clad with charred wood to reduce the need for maintenance (+ slideshow). 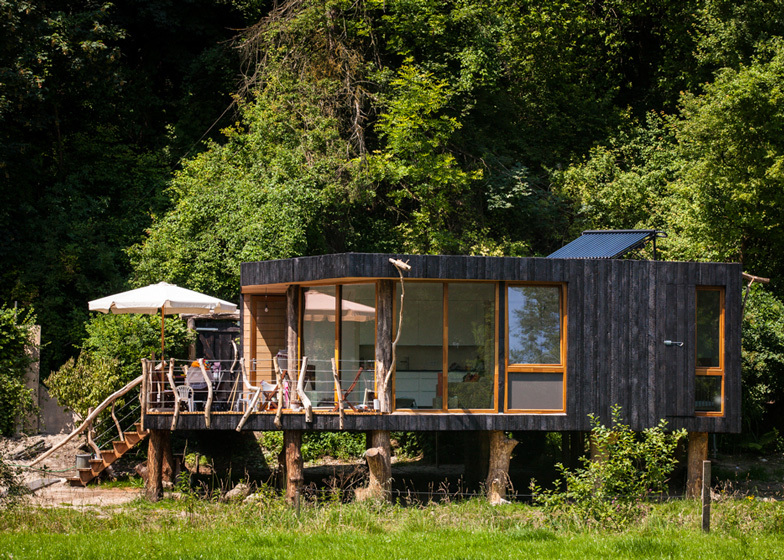 The small residence was designed by architecture studio Upfrnt, alongside charred timber consultancy Zwarthout. It is located on the banks of the fast-flowing Geul river, where construction is usually restricted to protect the environment, but was permitted as it replaced several dilapidated structures. The design team used the traditional Japanese Shou-Sugi-Ban technique to burn the surfaces of the cedar cladding panels, creating a sealed surface that will protect itself and almost never need repairs. The floor of the house is raised up by over a metre on a series of reinforced oak logs, as the nearby river is prone to frequent flooding. A wooden bridge links the entrance to the woodland pathway behind, while a series of steps leads down to the water's edge. The house incorporates several sustainable technologies that minimise its carbon footprint. "Upfrnt strive to design buildings that are in harmony with their environment," explains Weijnen. Alongside triple glazing and thick insulation, the house uses solar energy for heating and electricity. Waste water is also collected and filtered, so that it can be fed back into the river. To enable a speedy construction, the house was prefabricated in Amsterdam by construction firm WHD Interieurbouw and was assembled on site in just three months. Other sustainable houses we published include a self-sufficient house in China and an energy-generating home in Japan. Photography is by Hans Peter Föllmi. 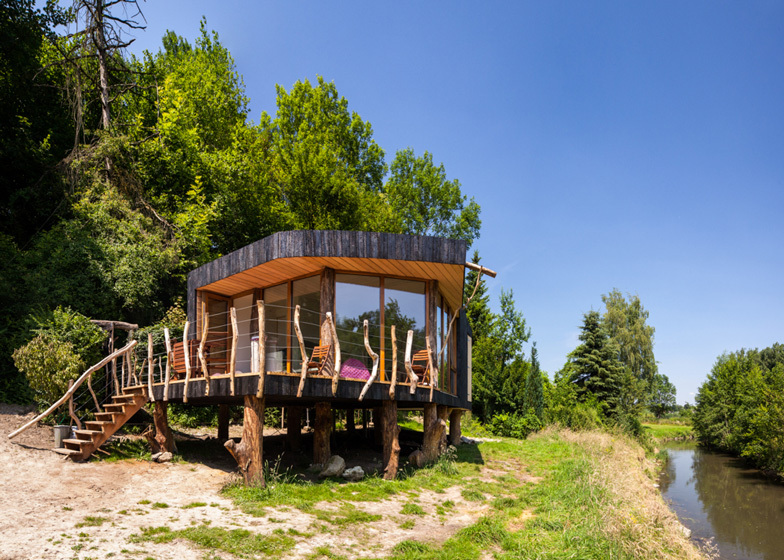 Tucked away on the banks of the River Geul in South Limburg is a unique new holiday house created by Upfrnt architects, WHD Interieurbouw and Zwarthout. Permission to build on the Geul, one of Holland's few fast flowing rivers is rarely granted because of the impact on the environment. Nevertheless the local council of Gulpen-Wittem was prepared to support this sustainable project in exchange for the removal of the original dilapidated buildings. An interesting challenge for all parties was the frequent flooding of the river. In order to prevent water damage, the house was raised on poles made from local trees. A risen path was created to connect the house with the alley behind it. Upfrnt strive to design buildings that are in harmony with their environment. The house is built following passive principles and has a low carbon footprint. Extra insulation and triple glass ensure year round comfort. Warm water is generated by solar heating. Electricity for cooking and heating is provided by solar panels elsewhere on the grounds. Sewage connection is unnecessary due to the use of a Helofytenfilter. Waste water is filtered and purified allowing it to flow back into the river cleaned. Use of the underground ventilation pipe for warming and cooling the incoming air increases living comfort considerably. The complexity of building on stilts and the innovative sustainable character of the house required a resourceful team. Amsterdam based building company WHD Interieurbouw worked together with ZwartHout and the architect to bring this project to successful completion. Despite huge window panes and an expansive view, the house is extremely private due to the positioning on the property. The house was prefabricated in Amsterdam and constructed on site. The silver sheen on the black exterior is the result of using the Shou-Sugi-Ban technique (Japanese burning of cedar panels) rendering the house virtually maintenance free. The building was completed within three months.